Nothing beats a bowl of hot soup on a COLD day! My name is Cheryl……….and I love Bear Creek Country Kitchen Soup! Have you seen this in your favorite grocery store? They’re sold in the soup aisle. I’ve been buying them for years! Just add water and in 15 minutes you can have the taste of home made soup without salving in the kitchen all day! One package makes 1/2 gallon of soup, that’s 8 one cup servings!! Our favorite is the Potato Soup. When it’s simmering on the stove, the smell coming from my kitchen is phenomenal. I like to add a little chicken and garlic to ours, and top with a little cheese when serving. I don’t know how a powdered soup mix can taste so delicious, but it does! For under $5 I can feed our family of four with plenty of left overs for lunch a time or two. You can’t beat that!!! So If you’re in the mood for the taste of quality, home-made soup, but you don’t have the time to start from scratch, soup mixes from Bear Creek Country Kitchens are the answer, they have several other varieties. *Get your soup/chili recipes ready to link up to Soup-a-palooza in Feb….details coming soon! 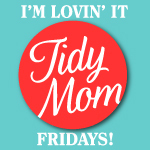 *Don’t forget to come back over the weekend for the I’m Lovin’ It Wrap Up post……were I feature a few of the great links!! I love Bear Creek soup mixes! They are super easy and taste so good! I clicked the “go here to get the button code” link and it isn’t going to the code? That is a good soup mix! New follower here…. I see you like to make cupcakes…what is your I’m lovin’ it-cupcake transporter? I ask because I had one disaster of taking cupcakes to a school function and never again volunteered. So how do you do it- transport cupcakes? I’ll have to write a post about them soon!! I have used these for years. Always keep in my food storage. Love all of these links. So many cute ideas and delicious treats! I love this soup too! Thanks for hosting, Cheryl! Thanks for hosting! Love this blog party! if you don’t, you can just leave a comment about what you are loving! Thanks so much for having us all over today. After a long week of cold here in the South, that soup looks so delicious! Have a great weekend! 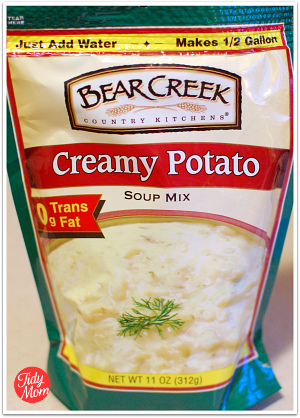 We love Bear Creek Soups, too! Our faves are this Creamy Potato and Beef Vegetable. 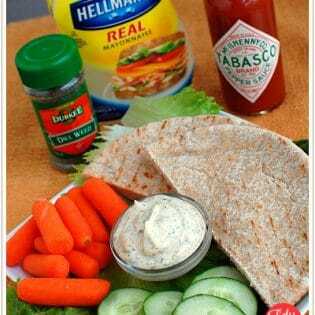 To the vegetable, I add a can of Ro-tel Tomatoes and Green Chilies as well as the suggested can of tomato sauce…yum! Gives it a spicy flavor! OOooh, I’m with ya! Bear Creek Mixes are yum-O!! Oh – my favorite is Broccoli Cheddar! The chili is really good too! Thanks for the tip! I love potato soup and will definitely look for this! We don’t have this in any of our markets (I’ve checked them all!) but you can bet that I’ll be looking in South Carolina and Georgia on our way to visit the Ranger next weekend! I love a good tater-soup! Why is it that every picture of food you post makes me want to rudely invite myself over to your house for a meal! 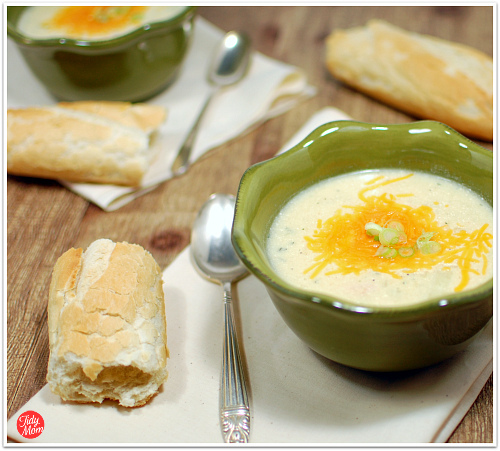 That soup and roll looks wonderful and the sprinkling of cheese….any left? I’m late to the link-up but better than never! Thanks for hosting Cheryl. The only problem with the eight servings in our family is that there are ten people and most of us will want seconds. Sounds great otherwise. Just so happens I just bought a package of this exact soup for the first time. Glad to hear such a glowing review. I think I will make it this rainy weekend coming up! I have seen these mixes and have always been curious about them. I’m BUYING them next time I go to the store. What a perfect thing to have in the pantry! That is one delicious looking soup, Cheryl! Yum! Thanks so much for the link up opportunity! I was in Big Lots yesterday and they had a big display of this soup. It is $3.00 per bag! Can’t wait to try it.